Who’s not excited about the idea of getting married? Most of us would be thrilled with the exception of those under duress when they got married. When it comes to having a wedding, each one of us has our own ideas, themes, concepts, layouts. But one thing which always remains the same is our desire, our desire to have a grand wedding and a fairytale wedding to be more precise. A wedding is the most important event the in the life of a person. It’s the start of a new process, i.e. building a new family. 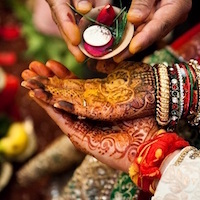 A wedding is the utmost symbol of commitment and the foundation of love for your partner. It’s a declaration to the whole world of your unquestionable affection to your partner. Building a home starts with the decision of choosing your partner. And this is officiated through a pious ceremony called the wedding. A marriage rite is very important because it binds you to a lifetime of commitment. It is a way of openly manifesting your utmost commitment to the person you choose to spend the rest of your life with. Long Capes and Churidars are a fantastic combo. Not only do they make you appear taller but also makes your body frame look thinner. It is suited for all body types and is extremely beautiful and graceful combination. Long Capes and Churidars sort of elongates your body, makes you look more majestic as well. When you add the right amount of makeup and accessory the look renders you no less than a show stopper. We recommend you to use a red bindi, or as a matter of fact, any colour of bindi, black, designed or even simple to complete the look. Without a touch of creativity, your dream wedding can be incomplete and what could be more creative than a simple yet beautiful combination of a crop top and a dhoti with peplum. It makes you look pretty yet fashionable. Crop tops are now a girl's best friend, we see crop tops capturing the market even better each day. Peplum tops, on the other hand, are a rather newer concept, yet we find girls going gaga over them. Peplums come in different cuts and shapes. We, therefore, recommend you to try out these two unique yet fashionable trends for your wedding day. These will especially look good with a chunky neck-piece and big rings. Clothes of different variance also work wonders with the look. 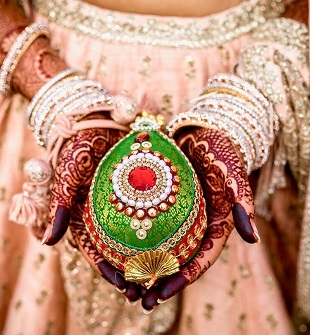 Fairytale weddings are also a reminder of the traditional Anarkali's that look perfect. They are a blend of elegance and beauty. Anarkali fashion is growing with each passing day. One should opt for the colour of the Anarkali based on the timing of the occasion, ie, if it's in the morning, evening or night and also based on the skin colour for the best results in the selection process. 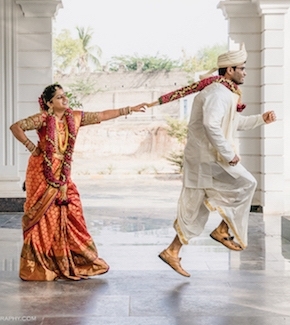 Fairytale weddings also witness the new trend of mixing a dhoti and a sari and pant saris. Not only are they easy to wear and comfortable they are also used as a recent trend in the 2016 marriage ceremonies. Dhoti saris and pant saris are also comparatively easier to put on and are also extremely comfortable. They are also easy to maintain. You can never really go wrong with them. You could experiment with different shades of these outfits and pick one that suits your personality. Keeping the look simple with a bun and good eye makeup never fails the look. Your desired wedding will be incomplete without a touch of crop tops and skirts, they are the perfect combo of traditional and modern. One can coordinate several colours including pastels for working wonders on their very special day! As already mentioned how crop tops are trending this wedding season, it's even noteworthy to mention the fashionable skirts that have made a comeback. People are absolutely loving this new duo. They together are often referred to as "co-ords". A pretty little crop top when mixed with the right kind of skirt does wonders, therefore we highly recommend you to try the look on your wedding day. We hope that you will love our Indian Clothing Style Ideas and if you do, kindly share and subscribe because your feedback means a lot to us!